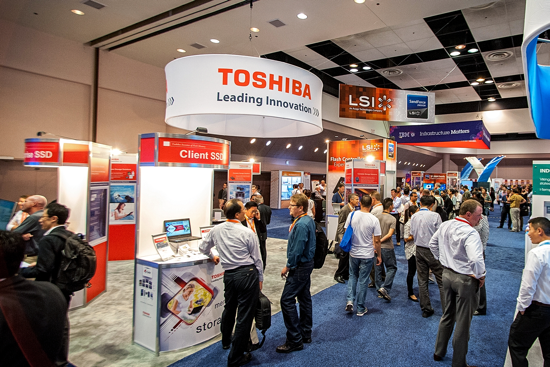 The Flash Memory Summit is once again at the Santa Clara Convention Center in 2018 to accommodate the continuous growth. Ten foot by ten foot exhibit space is $4,000 through December 31, 2017. We have spaces planned for 130 vendor exhibits, including island booths for premier and platinum sponsors, so this is a much-improved exhibit hall opportunity. Ten foot by ten foot exhibit space is $4,500 through December 31, 2017. We have spaces planned for 130 vendor exhibits, including island booths for premier and platinum sponsors, so this is a much-improved exhibit hall opportunity. NEW FOR 2018: 6'x2.5' product demo tables available for $1500 each, located near the FMS Theatre. All sponsorships now INCLUDE exhibit space, unless requested as non-exhibitor in the sponsorship package. 10 x 10 for Bronze. We have SOLD OUT five years in a row, so call now to discuss customizing your sponsorship or to talk about non-exhibiting sponsor opportunities. Once returning exhibitors have claimed the space for the upcoming year, exhibit space locations and promotional options are open to new vendors. At that time, they are available on a “first come, first served” basis, so they can both be selected when you commit to FMS 2018. Be aware that booths in Hall A and Island booths require a sponsorship commitment. Registration in 2017 topped 6100, with over 1000 end-users.. Growth was phenomenal as we added new vendor spaces. We featured 130 active vendor spaces, with a Flash Memory Summit Theatre and two DEMO AREAS for sponsors’ product presentations. ver had a speaker abstract returned as "too commercial"? Well, we have the just the place for CREATIVE COMMERCIALS in our Flash Memory Summit Theatre. Each SPONSOR gets the opportunity to present a "blatant product pitch" in the FMS Theatre during OPEN EXHIBITS. Highlight your products! Wow your customers! This is SALES & MARKETING THEATRE at its best. Don't downplay this opportunity. We saw as many as 100 people watching some of the product differentiation presentations. Each year, Flash Memory Summit awards "Best of Show" honors to a number of technology participants. Entry in this judged contest is $1000 (see Best of Show Awards page for rules and regulations), but the entry fee is waived for all current sponsors and exhibitors. Deadline is July 2018, as noted on the Awards Entry page. In addition to these great benefits, ALL sponsors choose one "sponsor promo item" that is uniquely theirs. Sponsors and exhibitors also get complimentary full-conference passes for ALL of their speakers (saving $300 each), and sponsors can negotiate the number of tutorial passes they need into their contract (with substantial discounts off the retail price of $1295 each). This way, you pay ONE SINGLE price for the conference, rather than seeing tens of thousands of dollars of "hidden" conference fees that show up later in your ROI calculations. We saw more press, more attendees, more speakers, more vendors, and most important, more customer end-users. 2018 is off to a fantastic start, and we are once again planning for substantial increases in head-count, exhibitors, and end-users, so make your plans sooner rather than later to get the best booth locations and sponsor options. Now in 2018, sponsors must supply their own give-aways. Flash Memory Summit does not order these directly, except by special arrangement. Sponsor Packages are outlined in the Exhibitor-Sponsor Prospectus. If you are announcing new products and/or technologies during the event you can submit a description (less than 30 words) which will be posted on the Exhibitor Highlights page. Call sales to reserve your exhibition and sponsorship package today. You can also download the Flash Memory Summit Sponsor and Exhibitor Prospectus for more information.